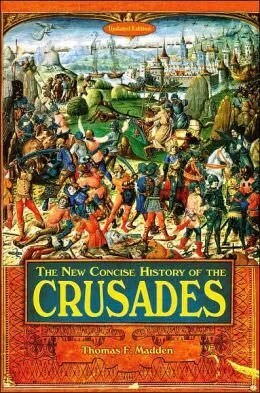 I just completed Thomas F. Madden’s The New Concise History of the Crusades, a nice hardcover edition published by Barnes & Noble in 2007. The main text clocks in a little over 200 pages and it covers the earlier crusades in some detail with attention also given to various crusades within Europe and a brief analysis of the impact of the crusades in the conclusion. I had previously read James Reston Jr.’s Warriors of God: Richard the Lionheart and Saladin in the Third Crusade, which I enjoyed thoroughly in spite of some obvious biases and liberties taken throughout the volume. I found Madden’s work similarly satisfactory – though again leaving me with a feeling that I read material written from a specific direction and implying certain things I, as a amateur, am not qualified to comment upon. The features of the book which I enjoyed the most where its fluid narrative which maintained a good level of readability while addressing complex situations spanning hundreds of years. The book also includes some beautifully clear (black and white) maps of the crusades which are extremely helpful, in my opinion, in understanding where everything occurred. What disappointed me in the work is that Madden seems to be trying to provide some social commentary on contemporary Christian/Islamic relations but fails to do so clearly enough. I can infer his meaning, as others have done – but I would have liked such an analysis to have been more thorough or abandoned completely. I looked at several reviews of the work to ensure it wasn’t overly biased, and it appears that it falls within acceptable boundaries of diversity in opinion among scholars. I’ve included links to those reviews below. Shirin Khanmohamadi. Review found in The Medieval Review 07.10.30. Indiana University. Sanjeev A. Rao, Jr. Book Review, World History Connected. University of Illinois. Patrick J. Holt. Review of Madden, Thomas F., A Concise History of the Crusades. H-Catholic, H-New Reviews. May, 2000. Bradley Cochran. Book Review: The New Concise History of the Crusades by Thomas F. Madden. Theo-Philogue, 02/08/2010. What did you perceive as Madden’s “social commentary on contemporary Christian/Islamic relations”? I find that all scholars tend to be driven by a motive to “show” something they think is relevant for a contemporary culture, but as long as you can discern these concerns you can judge with more caution the merit of argument apart from the social concern. On the one hand I felt like he was attempting to say that the crusades were not nearly as simple and straightforward as they are often portrayed – which I think is correct. He highlighted the atrocities committed by both sides as well as how to sometimes the sides would align with each other against common enemies – oftentimes Muslim and Christian versus Christian or Christian and Muslim versus Muslim. Madden also emphasized the religious (“pure”) motivations for the crusades by both sides, but with a preponderance on the Christian side…but didn’t do enough, imho, to explain what these religious opinions were and whether sincere faith is a justifiable reason for action. Finally, Madden made some significant sweeping judgments against “common” thought on the crusades (e.g. motivations, imperialism/colonialism, the effect of the crusades on Muslims) with what I felt was a tremendous lack of supporting evidence…the judgments felt like a late appendage to the book, and not something which the book itself had undertaken to explain (especially the idea that the crusades are a ‘recent memory’ for Muslims…whether this is true or not – I do not know – I would have liked to have seen more substantiation of the idea). Next story Infographic: Medications That Deplete Nutrients and How to Supplement Appropriately.